Acids and bases have been known by their properties since the early days of experimental chemistry. The word "acid" comes from the Latin acidus , meaning "sour" or "tart," since water solutions of acids have a sour or tart taste. Lemons, grapefruit, and limes taste sour because they contain citric acid and ascorbic acid ( vitamin C). Another common acid is vinegar, which is the sour liquid produced when apple cider, grape juice, or other plant juices ferment beyond the formation of alcohol. Vinegar is a 5 percent water solution of acetic acid. Besides having a sour taste, acids react with active metals to give hydrogen, they change the colors of indicators (for example, litmus turns from blue to red), and they neutralize bases. Bases change the colors of indicators (litmus turns from red to blue) and they neutralize acids. Hence, bases are considered the chemical opposite of acids. Most common acid-base reactions take place in water solutions (commonly referred to as aqueous solutions ). One of the earliest definitions of acids, advanced by the Swedish physicist and chemist Svante Arrhenius in 1887, stated that acid ionizes in aqueous solution to produce hydrogen ions (which are protons), H + , and anions ; and a base ionizes in aqueous solution to produce hydroxide ions (OH − ) and cations. Later studies of aqueous solutions provided evidence of a small, positively charged hydrogen ion combining with a water molecule to form a hydrated proton, H + (H 2 O) or H 3 O + , which is called the hydronium ion. Often, the hydronium ion or hydrated proton is represented as H + ( aq ). Hydrogen chloride (HCl), a gas, is an acid because it dissolves in water to yield hydrogen ions and chloride ions. This water solution of HCl is referred to as hydrochloric acid. A typical base, according to the Arrhenius definition, is sodium hydroxide (NaOH). It dissolves in water to give sodium ions and hydroxide ions. electrolytes. 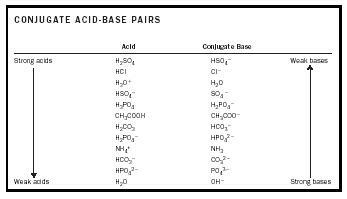 Table 1 lists some common acids and bases and indicates whether they are strong or weak. In acetic acid, hydrogen ions and acetate ions recombine to form acetic acid molecules. The double arrow signifies that at any given instant, less than 5 percent of acetic acid molecules dissociate into hydrogen ions and acetate ions, while the hydrogen ions and acetate ions recombine to form acetic acid molecules. Ammonia (NH 3 ) is a weak base, and although it does not have OH − ions in its formula, it produces the ion on reaction with water. A major problem with Arrhenius's acid-base theory is that some substances, like ammonia, produce basic solutions and react with acids, but do not contain hydroxide ions. In 1923 Johannes Brønsted, a Danish chemist, and Thomas Lowry, an English chemist, independently proposed a new way to define acids and bases. An acid donates hydrogen ions (also called a proton donor); a base accepts hydrogen ions (also called a proton acceptor). These definitions not only explain all the acids and bases covered by Arrhenius's theory, they also explain the basicity of ammonia and ions such as carbonate, CO 3 2− , and phosphate, PO 4 3 . The Brønsted-Lowry theory includes water as a reactant and considers its acidity or basicity in the reaction. In the partial ionization of acetic acid, water is a base because it accepts the hydrogen ion to form hydronium ion. A meticulous experimenter, Thomas Lowry is best known for his conceptualization of acid–base chemistry. Studies of nitrogenous compounds led Lowry to question fundamental aspects of the role of hydrogen during acid–base reactions. Three months before Brønsted published his theory, Lowry released his own similar thoughts on proton acceptors and donors in print. the conjugate base of acetic acid, CH 3 COOH. A pair of molecules or ions related to one another by the gain or loss of a single hydrogen ion is called a conjugate acid-base pair. In the reaction of ammonia, water is an acid because it donates a hydrogen ion to ammonia. This ability of water to donate or accept hydrogen ions, depending on whether it reacts with a base or an acid, is referred to as "amphiprotic." The conjugate acid-base pairs in this reaction are NH 3 /NH 4 + and H 2 O/OH − . In the preceding reaction, water and hydroxide ion are a conjugate acid-base pair, whereas carbonate ion and bicarbonate ion are a conjugate base-acid pair. Every Brønsted-Lowry acid has a conjugate base, and every Brønsted-Lowry base has a conjugate acid. Familiarity with conjugate acid-base pairs is important to understanding the relative strengths of acids and bases. Table 2 lists some conjugate acid-base pairs and their relative strengths. Strong acids have weak conjugate bases, and weak acids have strong conjugate bases. Several common acids have more than one ionizable hydrogen ion (Table1). Each successive hydrogen ion in these polyprotic acids ionizes less readily. For example, sulfuric acid is a strong acid because of the complete ionization of the first hydrogen ion. The HSO 4 − also acts as an acid, but it is not 100 percent ionized, so HSO 4 − is an acid of moderate strength. For example, sodium hydrogen sulfate is used to increase the acidity of swimming pools, whereas sodium carbonate is used to increase the basicity of swimming pools. Phosphoric acid has three ionizable hydrogen ions. Each stepwise ionization of phosphoric acid occurs to a lesser extent than the one before it. Phosphoric acid is stronger than acetic acid because the first step ionizes to a greater extent than acetic acid. However, H 2 PO 4 − is a weaker acid than acetic acid because the second ionization is much smaller (by a factor of 10 5 ) than the first step. The third ionization is also much smaller than the second step (by a factor of 10 5 ). Ions such as H 2 PO 4 − , HPO 4 2− , HCO 3 − , and HSO 4 − can act as an acid by donating a hydrogen ion or as a base by accepting a hydrogen ion. This ability to act as either an acid or a base is referred to as an amphoteric property. The Brønsted-Lowry acid-base definitions are based on the amphiprotic properties of water: Water is capable of acting as both a hydrogen ion donor and a hydrogen ion acceptor, depending on the acidic or basic properties of the dissolved substance (equations 9 and 10). Water can also act as a proton donor and proton acceptor towards itself. This is referred to as the autoionization of water. Pure water is neutral because it contains equal numbers of hydronium ions and hydroxide ions. However, pure water only slightly ionizes, about 1 in every 55,000,000 water molecules is ionized at any given time. The actual molar concentration of hydronium ions and hydroxide ions in pure water at 25°C is 1.0 × 10 −7 . The product of the molarity of the hydronium ions and hydroxide ions of pure water is (1.0 × 10 −7 ) (1.0 × 10 −7 ) = 1.0 × 10 −14 . The value of 1.0 × 10 −14 is important to the study of aqueous solutions of acids and bases because it is a constant that is always the product of the molar concentration of H 3 O + and OH − . 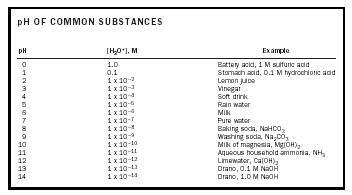 Table 3. pH of common substances. acid is fully ionized. From the equation, the molar concentration of OH − is 10 −13 . For a 0.1 M solution of NaOH, the OH − is 0.1 M , but the hydrogen ion concentration is 10 −13 . Hence, the value of the exponent for hydronium ion concentration goes from −1 in strong 0.1 M acid to −13 in strong 0.1 M base. In 1909 the Danish biochemist S. P. L. Sørensen proposed that these exponents be used as a measure of acidity. He devised a scale that would be useful in testing the acidity of Danish beer. Sorensen's scale came to be known as the pH scale, from the French pouvoir hydrogene , which means hydrogen power. pH is defined as the negative logarithm (log) of the hydronium ion concentration. The brackets around hydronium ion mean moles per liter of hydronium ions. The pH scale includes values between 0 and 14. The pH of pure water is 7 because [H 3 O + ] is 1.0 × 10 −7 . The pH of 0.1 M HCl is 1[−log 10 −1 = −(−1)]. The pH of 0.1 M NaOH is 13(−log 10 −13 ) = 13. The pH scale does not apply to concentrations greater than 1.0 M for a strong acid (pH = 0) or 1.0 M for a strong base (pH = 14). For solutions in which [H 3 O + ] is not an exact power of 10 (0.1, 0.01,...), a calculator can be used to determine the logarithm. For example, if the [H 3 O + ] is 1.5 × 10 −3 M , the logarithm is −3 + log 1.5 = −3 + 0.18 = −2.82, and the pH is −(−2.82) or 2.82. Table 3 provides the pH values of some common solutions. Table 4. Common acid-base indicators. anthocyanins. Over the pH range of 2 to 12, these anthocyanins change from red (pH 2) to pink (pH 4) to purple (pH 6−7) to green (pH 10) to yellow (pH 12), which makes red cabbage extract a "universal indicator." The chemical species HIn and In − are different colors. When the solution is acidic to the degree that the HIn species dominates, it will be the color of HIn. When the solution is more basic with In − dominating, it will be the color of In − . Some common indicators and the pH ranges for their color changes are listed in Table 4. As illustrated in equations (22) and (23), the addition of either a strong base or a strong acid produces one of the components of the buffer mixture and so the pH does not change. Buffers are limited in their buffer capacity, that is, the amount of a strong acid or strong base that can be added before the pH changes by 1 pH unit. Buffers are very important to many industrial and natural processes. For example, controlling the pH of blood is essential to human health. The pH of blood is normally 7.40 ± 0.05, and good health depends on the ability of buffers to maintain the pH of blood within this narrow range. If the pH falls below 7.35, a condition known as acidosis occurs; increasing pH above 7.45 leads to alkalosis. Both these conditions can be life threatening. Two buffer systems, H 2 CO 3 /HCO 3 − and H 2 PO 4 − /HPO 4 2− , control the pH of the blood. In the early 1930s Gilbert Lewis, an American chemist, proposed a more general acid-base theory that is based on sharing electron pairs rather than proton transfers. A Lewis acid is a substance that can accept a pair of electrons to form a new bond, and a Lewis base is a substance that can donate a pair of electrons to form a new bond. All Arrhenius and Brønsted-Lowry acids and bases are Lewis acids and bases. However, Lewis acid-base theory is more general because a Lewis base can donate an electron pair to something other than H + . For example, the gas phase reaction of NH 3 with BF 3 is a Lewis acid-base reaction. Note that liquid ammonia still falls within the Brønsted-Lowry definitions since NH 4 + is a proton donor and NH 2 − is a proton acceptor. The Brønsted-Lowry theory, which defines acids as proton donors and bases as proton acceptors, covers all acid-base reactions in aqueous solution. The strength of acids and bases is related to the percent of their ionization in water. Strong acids and bases are 100 percent ionized, whereas weak acids and bases are less than 5 percent ionized. There are a number of salts that have acidic or basic properties in solution. For example, baking soda, NaHCO 3 , can be used as an antacid because the bicarbonate ion, HCO 3 − , is a strong enough conjugate base to combine with H 3 O + to give carbonic acid. The pH scale is a convenient way to represent the acidity or basicity of dilute acid and base solutions. Pure water has a pH of 7; acidic solutions have pH values http:// 7 and basic solutions have pH values 7. Each change of one unit of pH is a tenfold change in acidity. Acid-base indicators, such as litmus and phenolphthalein, can be used to measure whether a solution is acidic or basic. A natural "universal indicator," red cabbage extract, can be used to determine the pH within 2 pH units. A buffer contains equal amounts of either a weak acid and its conjugate base or a weak base and its conjugate acid. SEE ALSO Arrhenius, Svante ; Bases ; BrØnsted, Johannes Nicolaus ; Chemical Reactions ; Lewis, Gilbert N. ; Solution Chemistry . Atkins, Peter, and Jones, Loretta (1997). Chemistry: Molecules, Matter, Change , 3rd edition. New York: W. H. Freeman. Joesten, Melvin D., and Wood, James L. (1996). The World of Chemistry , 2nd edition. Fort Worth, TX: Saunders College. Moore, John W.; Stanitski, Conrad L.; Wood, James L.; Kotz, John C.; and Joesten, Melvin D. (1998). The Chemical World , 2nd edition. Philadelphia: Saunders. Shakhashiri, Bassam Z. (1989). Chemical Demonstrations , Vol. 3. Madison: University of Wisconsin Press. "CHEMystery: An Interactive Guide to Chemistry." Available from http://library.thinkquest.org/3659/acidbase/ .